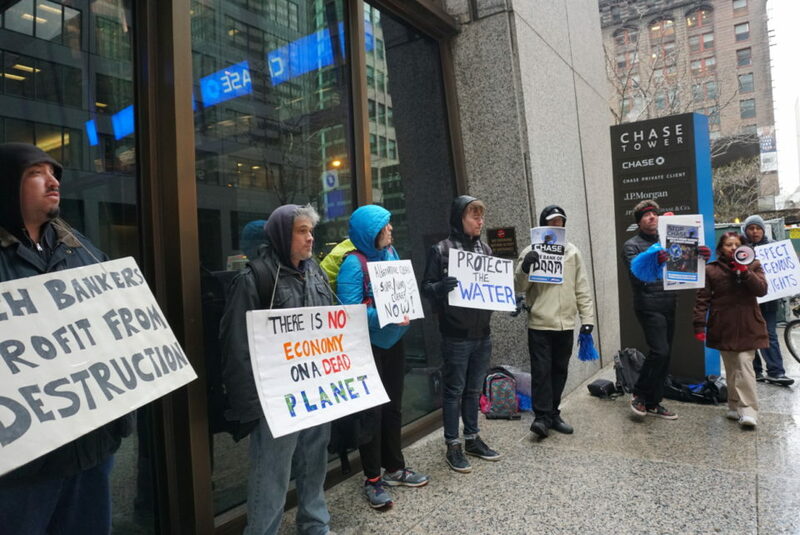 Chicago, Ill. (April 10, 2019) — Chicagoans, led by the group Rising Tide Chicago, took to the streets Wednesday to demand that JPMorgan Chase & Co. pull all of their assets from the fossil fuel industry and make a swift transition to renewable energy sources to avert the worst effects of climate catastrophe. Evan Hoffman leads Rising Tide Chicago supporters in chants calling out Chase Bank for being “#1” in funding pipelines, tar sands and climate destruction. Photo by Amelia Diehl. Rising Tide Chicago’s action was one of dozens across the US as part of the National Day of Action to call on Chase Bank and Wells Fargo, top fossil fuel funders, to divest. The Chicago group took action in solidarity with the other actions organized by local chapters of 350.org, Rainforest Action Network, Sierra Club, and other partners. Before the rally, a small group delivered letters signed by local and regional supporters to the office of James Crown, a member of Chase Bank’s Board of Directors. The letters called on Crown to tell the bank to stop profiting off climate destruction. Supporters then grouped outside the Chase Bank building in downtown Chicago at 4pm, holding signs reading “Chase Bank Biggest Fossil Fuel Investor”, “Tar Sands = Genocide”, “Defund the Pipeline” and others. 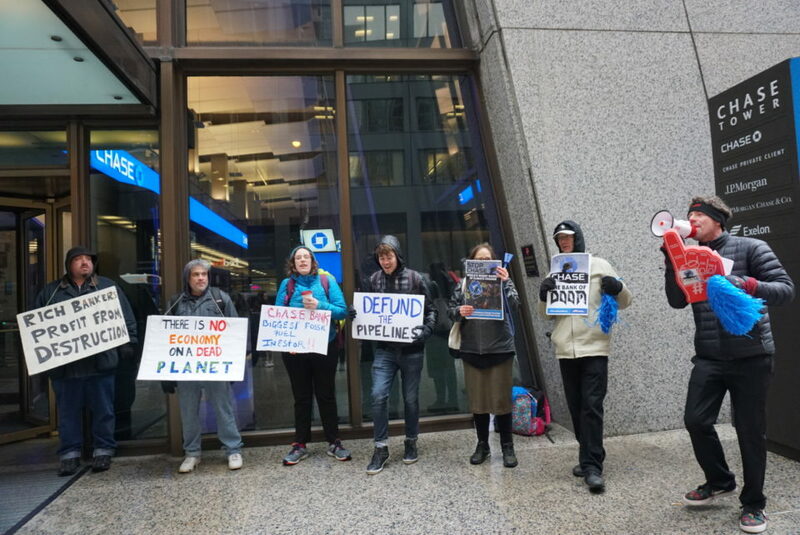 In the afternoon’s cold rain, the group chanted and informed passersby about the bank’s complicity in funding climate destruction. “The stakes are high here. Chase Bank is truly the worst of the worst, funneling the most money into the fossil fuel industry of any bank in the world. We are here to demand that Chase Bank stand on the right side of history. 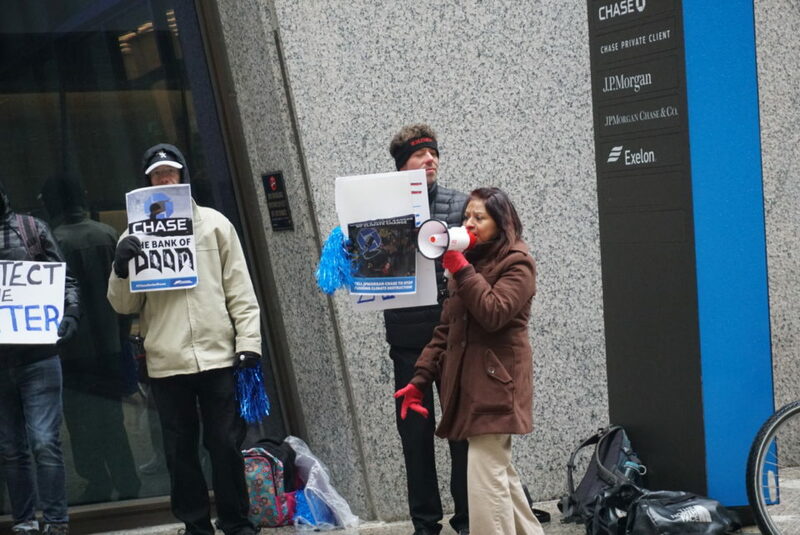 Chase needs to pull their money out of a dying industry to help our dying planet, and invest in the growing industry of renewable energy,” said Amelia Diehl, Rising Tide organizer, speaking to the crowd walking past. Supporters then delivered more letters to the bank’s Midwest Regional Director. The note also included a copy of Rainforest Action Network’s 2019 Banking on Climate Change Report, which details how Chase Bank is the number one Wall Street funder of fossil fuels in the world. Rose, local organizer with Rising Tide Chicago and PERRO, leads the rally outside Chase Tower in downtown Chicago. Photo by Amelia Diehl. The report, released last month, reveals Chase Bank’s abysmal record of funding pipelines that threaten our drinking water and disastrously disrespect Indigenous and human rights. Chase Bank has invested over $195 billion in fossil fuels since 2016, making it the biggest funder of extreme fossil fuel projects in the world and the biggest funder of tar sands oil in the US. Tar sands oil is one of the most energy intensive fuels to extract, and emits more greenhouse gases than conventional oil. Chicago is at an epicenter of a pipeline network delivering this oil from Alberta, Canada to the Gulf of Mexico, putting the Great Lakes and other water supplies at risk of severe contamination. By funding these pipelines, Chase Bank is complicit in human rights and Indigenous rights abuses. Dozens of tribes have signed the Treaty Against Tar Sands Expansion, opposing all tar sands projects given each tribe’s right to Free, Prior and Informed Consent to review and reject any new project. Tar sands pipelines such as Line 3, Keystone XL and others have proceeded despite widespread resistance from water protectors from the Anishinaabe, Fort Belknap and Rosebud Sioux, among other tribes. “The fossil fuel industry is a dying industry. Without Chase Bank’s money, these pipelines couldn’t be built, and we need to stop all projects before they further damage our land and water. We all need water to live, and we stand in solidarity with Indigenous and other frontline leaders who are fighting to protect their water sources. We are all downstream,” said Angie Viands, a Rising Tide Chicago organizer. Supporters of Rising Tide Chicago rally outside Chase Tower in downtown Chicago as part of the National Day of Action to Shut Down Chase and Defund Climate Change. Photo by Amelia Diehl. “It is absolutely outrageous and disgusting that while the citizens of the world are working hard to save the planet from climate catastrophe, Chase is busy funneling billions to continue us down a path to planetary death. Their shameful greed must stop now. They must divest from fossil fuels — and we will put the pressure on to make them do it!” said Evan Hoffman, another Rising Tide Chicago organizer. Rising Tide Chicago is a local grassroots chapter of a global organization working to address the root causes of climate change and push for a just transition. This urgent campaign is part of a global effort to call on banks and other institutions to divest from all fossil fuel infrastructure, knowing the world cannot keep burning oil and gas if we are to reach the goal of limiting global temperature rise to 1.5 degrees Celsius, as outlined in the Paris Climate Agreement. “The time to act is now. Climate change is already devastating the whole planet, hitting communities marginalized by colonialism the hardest. In the midst of environmental crisis, Chase Bank is choosing profits over human health and safety. We will continue working together with urgency, because grassroots power will win.” said Erin Rusmi, Rising Tide Chicago organizer.